Tilray's revenue is growing, but its not nearly as big a cannabis company as its competitors are. Investors' optimism over marijuana's future has turned Tilray Inc. (NASDAQ:TLRY) into the biggest marijuana stock by market cap; however, Aurora Cannabis (NYSE:ACB) and Canopy Growth (NYSE:CGC) are much bigger companies based on marijuana production and revenue. Could they benefit more than Tilray from Canada's approaching recreational market? Tilray's headline-grabbing performance has captured investors' attention, but they might be better off concentrating on its competitors. Why? Because Aurora Cannabis and Canopy Growth's past investments in marijuana production should allow them to win more market share than Tilray when Canada's recreational marijuana market opens for business next month. Aurora Cannabis and Canopy Growth's size advantage over Tilray is significant. With funded production capacity of about 570,000 kilograms next year, Aurora Cannabis could have the most capacity available to meet a surge in marijuana demand. Canopy Growth is on pace to have more than 500,000 kilograms of production capacity next year too, so it's no slouch, either. Tilray is a bit ant-sized by comparison. Earlier this year, it announced it'll have about 76,000 kilograms of capacity by the end of 2018 and only about 150,000 kilograms of capacity at the end of 2019. That means that even after doubling its capacity next year, Tilray's annual marijuana production will still be less than one-third that of Aurora Cannabis and Canopy Growth. Tilray's 95% year-over-year increase in revenue last quarter to 12.7 million Canadian dollars (US$9.7 million) is impressive, but despite the increase, its revenue still trails Aurora Cannabis' and Canopy Growth's sales. In their most recently reported quarters, Aurora Cannabis reported revenue of CA$16.1/US$12.7 million, and Canopy Growth reported sales of CA$25.9/US$20.1 million. CGC Revenue (Quarterly) data by YCharts. 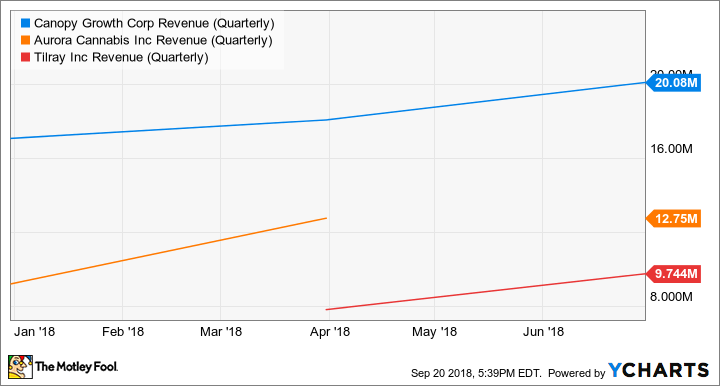 One of the bull arguments for ignoring Tilray's sales disadvantage to its competitors is that Tilray gets about 45% of its sales from marijuana extracts, such as oils, that command higher prices per gram and thus are more profitable than dried flower. It's true that a larger percentage of sales comes from oils, but Aurora Cannabis and Canopy Growth aren't going to let Tilray have that market all to itself. They fully understand the price and profit advantage of selling finished goods, and as a result, they're also focusing on products like cannabis oils, putting them increasingly in competition with Tilray. Last quarter, about 26% of Canopy Growth's revenue came from oils and gel capsules, up from 19% in the same quarter last year, and oils account for about 20% of Aurora's cannabis product sales. I think it's a good bet that both Aurora Cannabis and Canopy Growth will increasingly compete on Tilray's turf, and if so, Tilray's product-mix advantage could fade. All three companies have been stockpiling marijuana so they can hit the ground running next month when Canada's recreational sales begin. I think Tilray will enjoy significant sales growth because of marijuana's growing addressable market next year, but I suspect it will be Aurora Cannabis and Canopy Growth that capture the lion's share of sales. For this reason, investors interested in owning marijuana stocks might want to shift their attention to the larger players, at least until Tilray's share price retreats.